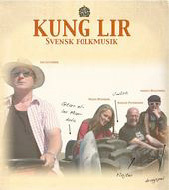 How can one describe the band, Kung Lir ? (myspacelink) 21st century folk music with influences from other musical genres? 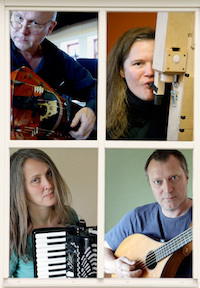 A meeting of four musicians from diverse backgrounds and orientationsThe hurdy-gurdy, recorder, pipes, guitar, mandolin, accordion and song makes for an exciting and unusual sound. (folk music without a fiddle, is that really possible?) Many of the songs are original – we are not traditionalists in the ordinary sense of the word – no matter how much new and innovative material we may come up with, the fundamental feel is still discernably coloured by Polish, Scottish, Norwegian and many other influences that combin so well with our own sound. Harald Pettersson Harald Pettersson is also proficient on the more unusual of the above named instruments. Harald has probably been involved with folk music longer than any of us. He has played alongside the big names in the genre, ”live” in concert as well as on CD recordings. The students at the college of music that play the hurdy-gurdy have him as their teacher. One song that he wrote is called ”Julling”. It´s a song that`s extremely hard to end, wrap-up, to conclude! ”It doesn`t have many pauses for breathing” exclaims Agge. Aka…. Agneta Hellström. Well, she would be interested in breathing spaces since she plays recorders of all shapes and sizes, as well as playing all kinds of other music. Recorder players are more commonly seen in a baroque context. Yet Agge, is likely to pop up anywhere as in Kung Lir for example. Once upon a time Agge and….Malin Hülphers had the same singing teacher at music college. ( We`re talking about the eighties) In this band, Malin plays accordion. She enjoys this a lot. She also has a history as a ”Backing vocalist” and frequently makes a living as a composer of opera. (Which is also bags of fun) ”Aprilvalsen” and ”Vittring” are a couple of her songs.